Make your car, truck, motorcycle, Jeep, ATV, or UTV stand out with these C.O.B. (chip-on-board) LED "Angel Eye" headlight accent lights.. The long-lasting halo rings can be used as white daytime running lights, amber turn signals, car show accent lighting, and as city light alternatives to provide a decorative glow around vehicle headlights. The circular LED lights can also be used for general accent lighting. A variety of sizes are available from 60 mm - 160 mm. The type of C.O.B. LEDs used in these halos are also sometimes called "Plasma". 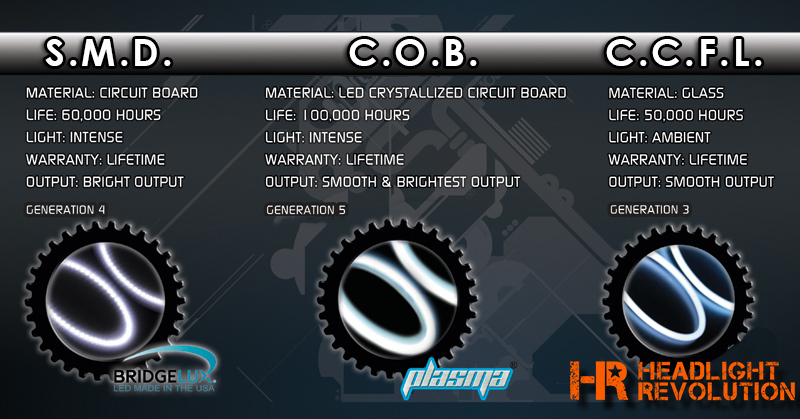 These C.O.B./Plasma LEDs emit a solid-even 180° beam of cool white, blue, green, amber, or red illumination with no hot spots or glare. The LED halo rings include an external constant current driver for 12-18V DC operation and have 29" power wires for easy installation. Price for each halo ring.